Back-Up Story: "History of the Multiverse - Chapter Five"
Donna Troy fights back against Forerunner and actually manages to impress the assassin of the Monitors. In Metropolis Jimmy Olsen continues his investigation into Lightray's death and finally admits to himself that he has had strange power surges. Back in Washington D.C. Donna Troy uses every weapon at her disposal to defend herself against Forerunner. While the Monitors continue their debate on how to handle beings such as Donna Troy and Jason Todd another of their number travels to D.C. to prevent Forerunner from killing Troy and Todd. On the JLA satellite the Legionnaires are released from their cells, though all of them are frustrated by the fact that they don't have greater mobility. Dr. Mid-Nite informs them that until they remember why they are there the Justice League and Justice Society are going to keep an eye on them. Back on Earth the Monitor departs with Donna and Jason leaving Forerunner behind. Feeling that her purpose has been taken from her, Forerunner removes the braid that was her physical link to the Monitors. From a distance Monarch watches Forerunner and schemes. 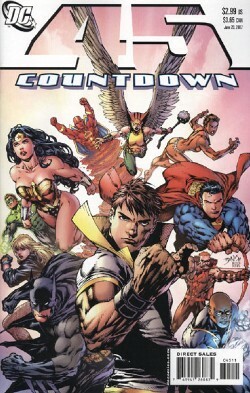 The Monitor continues the history of the Multiverse and discusses the tragedy of Sandman's protégé Sandy, the discovery of Earth Prime and Earth-S, the JLA/JSA meeting that involved the Legion and Mordru, the introduction of Ultraa, the death of the Earth-2 Batman and the first Mister Terrific along with the two teams of Justice fighting Darkseid, the Ultra-Humanite and the Commander. Main Story - 4: Wow, Donna Troy is one bad mama jama. I mean did you see her? Wow, that was awesome. Sure I'm not so hot on the whole Forerunner thing and Monarch coming in at the end was a bit, "eh," but over all this was a decent chapter in the COUNTDOWN saga. The Jimmy Olsen end of the series is far more interesting than I thought it would be. His bit in this issue was mainly expository but it gave a good run down of the New Gods, so there's that. Between this issue and the last one I was reminded how important Jimmy is in the history of the New Gods and considering what a huge fan I am of the Fourth World concept I should have put two and two together sooner. In any case between this and Jimmy finally admitting his burst of power this storyline is starting to pick up. As much as I liked seeing Donna deliver a solid beat down on Forerunner I'm not sure how I feel about the character overall. There's something about the nigh-unbeatable villain that seems a bit played out. The whole thing between her and the Monitor was interesting but the bit with Monarch at the end left me with a bad feeling about this part of the story. I'm still trying to decide if the Sarah Conner joke was enough to justify the scene with the League. Ah heck, I'm in a good mood today. It did. So all in all a good chapter in this mad cap weekly comic book. I wasn't all that hot on Forerunner but the rest of the book more than made up for it. Main Art - 4: The art in this story was great, but if I had to nail down one image that stood above the rest it was that two page spread of the New Gods. Wow. Just freaking wow. The New Gods are just as easy to screw up artistically as they are in terms of story, so this was something special. The rest of the story had solid art. If I was going to buy any of it, I would save up for the New Gods spread. Back-up Story - 4: I'm still enjoying this back-up even if it is getting repetitive. Still, as far as giving new readers an idea of what the old school Multiverse was like it is doing a bang up job. By the way, the dude fighting the Earth-2 Robin is writer Cary Bates. One of the JLA/JSA team-ups had Cary Bates developing powers and fighting the combined might of both teams. If you don't know who the guy in glasses with the Flash is then I can't really help you. Back-up Art - 4: Dan Jurgens deserves some kind of award for making the original Earth-2 adult Robin costume look somewhat decent. I mean he really does. Sure I liked the art in this story because I dig Jurgens' style and loved to see him draw his versions of all the big JLA/JSA team-ups, but man, he didn't make that costume look good but at least I didn't want to tear my eyes out. Cover Art - 5: Hey, didn't the last chapter of the "Lightning Saga" come out this week? All kidding aside this a solid shot of the League and Karate Kid. There are rumblings that he may become a member, which would be interesting. In any case this was a good cover even if this Justice League portion of this story was rather small.